Margaret joined the Pasadena Community Foundation Board in 2013, and she has visited a number of local nonprofits with Jennifer and the team from PCF. These visits provided Margaret with insight regarding how well the Foundation staff understands the needs in the community, and how to best provide support. 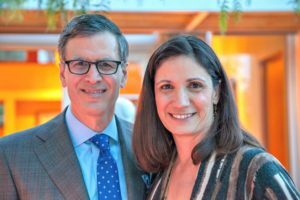 Margaret and David recently set up the David & Margaret Mgrublian Endowment with PCF as a way to give back to the community for years to come. “We simply wanted to help the people in our community to make it a nicer place to live,” said Margaret. She appreciates how the endowed fund will grow in the coming years, while providing annual gifts to local nonprofits. David was born right here at Huntington Hospital, and grew up in South Pasadena. Margaret was raised in the San Fernando Valley and moved to Pasadena when they married in 1987. They have two daughters who have inherited their parents’ philanthropic spirit.